The Bradley Fighting Vehicle is an armored personnel carrier, which is currently replacing the older M113 series. Its main purpose is to carry infantry in to combat, provide fire support on operations, and destroy enemy tanks and other vehicles. The Bradley also has four more weapons at its disposal. The first is the M240C, a 7.62mm machine gun that is located to the right of the M242. The second is the M257 smoke discharger. The Bradley has two of these, both of which can loaded with up to four of the smoke grenades, and used to cover it and/or the troops that it carries. 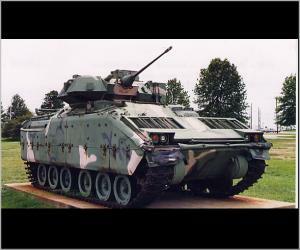 The third is the TOW anti-tank missile system, which allows the Bradley to take out any armored vehicle that opposes it. The fourth is the m231 firing port weapons. The TOW (tube launched opticly tracked wire guided missle) `missle can be fired on the move but only at slow speeds. Since the weapon is wire guided it is hard to track while on the move. However, it makes up for this by having heavy armor around the area that the infantry soldier must be in to be able to fire/reload the system. The Bradley's has a VTA-903T engine, and an HMPT-500 three speed hydro mechanical transmission, which allow it to go up to 66 km/hour on land (easily keeping up with the Abrams), and up to 7.2 km/hour in water. Water? Why yes! The Bradley is not just limited to land; every single model of the Bradley is capable of traveling in water. In the first few models, a Bradley crew could apply a waterproof barrier, which took about 30 minutes to set up. However now in the newer models of the Bradley's, the barrier is replaced by a pontoon, which can be inflated in only 15 minutes, half the time of the older models. On the subject of models; basically there are two classes of Bradley's, with many types of models under each class. First is the M2 Bradley, a.k.a. the Infantry Fighting Vehicle (The one in Ghost Recon is also the M2, which you can see in action in Mission 14: Willow Bow). The M2 has a three-man crew; there is a driver, a gunner, and Bradley commander, and can also carry up to six infantry soldiers and their equipment. There are four basic models of this Bradley: the M2, M2A1, M2A2, and M2A3. Basically the differences between the models are minor little details, like the addition of more electronic devices to assist the crew of the Bradley's (laser range finders, thermal vision, target tracking, etc...). The second class of Bradley is the M3, a.k.a. Cavalry Fighting Vehicle. There really is not a major difference between the M2 and M3. Basically the M3 does not have external firing ports, and sacrifices room for soldiers (hence why its only used by small scout teams). Instead the extra space is used to carry more equipment and ammunition for the troops and Bradley crews. The model numbers of the M3 are the same as its brother the M2; the M3, M3A1, M3A2, and M3A3, with the same adjustments as the other M2 models. The first 2 models of the M2/M3 (the A0 and A1 models) were able to swim. The A2, A2 ODS (Operation Desert Storm) and the A3 models can not swim due to there wieght. All in all the M2/M3 Bradley's allow infantry troops to move quickly and safely, wile being able to support them when things come to worse. They have proven themselves over time to be reliable, durable, and a deadly ally to have in combat, and will continue to do so for the years ahead. Width : 10' - 6"